Night, February 15, 1898, the American battleship USS Maine lay at anchor in the harbor of Havana. Although tensions were running high between the US government and Spain, the colonial power occupying Cuba, the night was calm. Suddenly, at 9:40 PM, a huge explosion devastated the forward section of the Maine, an external explosion setting off the powder in the magazines of the Maine. Into this vision of hell on Earth strode the Catholic Chaplain of the Maine, John P. Chidwick. Born in New York City on October 23, 1863, John Chidwick graduated from Manhattan College with a BA (1883) and an MA (1885). Ordained at St. Joseph’s Seminary in Dunwoodie, New York in 1887, he spent several years serving as a parish priest before being commissioned in 1895 as the third Catholic Chaplain in the history of the United States Navy. He was eventually assigned to the Maine. He rapidly became popular with the members of the crew, no matter their religion. Friendly and outgoing, he did whatever he could to help the crew and was always available to listen to their problems. When he arrived on deck on the night of the destruction of the Maine, Father Chidwick instantly gave a mass absolution. He then sprang into action, rescuing wounded, giving first aid, and giving the last rites. He seemed to be everywhere that grim night. W. T. Culverius, who was serving on the Maine as a naval cadet and who later rose to the rank of Rear Admiral had this to say about Chaplain Chidwick : “On that dread night in 1898 when the MAINE was destroyed, Chaplain Chidwick was everywhere present. He had a word of cheer to the injured which soothed their pain. Without thought of himself he helped the helpless and he ministered to the dying who will welcome him now in that Great Ship’s Company above, where shipmates never part.” It should be remembered that Chaplain Chidwick and the other men engaged in the rescue of their stricken crewmates had no way of knowing that at any moment further blasts might send them all to eternity. Father Chidwick was one of the last men to leave the Maine that night. 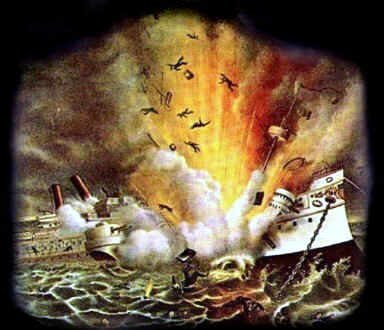 266 sailors died in the sinking of the Maine and 89 survived. 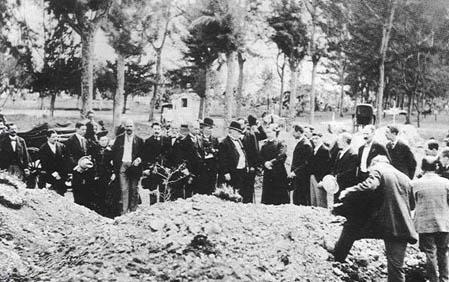 The funeral of the dead of the Maine was held in Havana on February 17, 1898 in the Christobal Colon cemetery in ground donated by the Spanish government. Father Chidwick conducted the burial service. I grieve with you most profoundly in your awful loss. Your brother was a good man. I do not remember a Sunday when he missed mass, when he could have attended. He was a faithful member of the Sacred Heart society and daily recited his decades of the rosary. I think he was at his communion at Christmas and I know he was preparing for his Easter duty. These are many consolations, especially when we know that an all-merciful God will judge him who has more pity on our dead that we ourselves have. You know it is a promise of the Sacred Heart to grant the blessing of a happy death. When I came on deck during the disaster, I immediately granted absolution. May we not hope that this had its Effect on good souls as his was. I do not know if I have recovered the body, I mean, to identify it. It is most likely that the body has been recovered and I think I have identified it. We received a body about his size, with Marine underclothing, and faintly marked on the clothing J.B. The letters washed out but I an certain they were there. I believe this is the body of your brother. If so, it lies buried in the Catholic cemetery of Havana and was interred with Catholic rites. Recommending you to the consolations of Holy Mother Church and begging a remembrance in your prayers for myself and all our men here living and dead. The sinking of the Maine remains a matter of controversy. I think it unlikely that this was an official Spanish action, as no documents have come forth to reveal this and the Spanish Navy distinguished itself that night in attempts to rescue the men of the Maine. The official Navy investigation concluded that a mine sank the Maine, although it also stated that the board of inquiry was unable to definitively assign blame for the incident to Spain. Subsequent investigations have reached varying conclusions, with some concluding that spontaneous combustion in a coalbunker of the Maine was the cause of the explosion. A 1999 investigation by National Geographic reached the same conclusion as the Navy did at the time that a mine was responsible. Assistant Secretary of the Navy Theodore Roosevelt stated prophetically after the sinking that he doubted that it would be possible to learn just what caused it. Father Chidwick as a result of his actions on the Maine became a huge national hero. He was a much sought after speaker, as this article here from the New York Times on January 30, 1899 indicates. Father Chidwick was a firm patriot, but he also was willing to oppose the policy of the US when he believed it was mistaken as he did in the Friars Controversy in the Philippines, as this outraged article here by a liberal Protestant journal of the day indicates. The fight of Pope Saint Pius X against Modernism led to Father Chidwick’s assignment in 1908 as rector of his old seminary after Father Driscoll, his predecessor, made an ill-fated attempted to produce a Modernist leaning journal. In 1924 he became the President of the College of New Rochelle a post he held until his death in 1935. 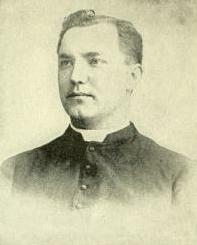 Throughout the years Monsignor Chidwick, as he eventually became, remained active in Spanish American War veteran groups. 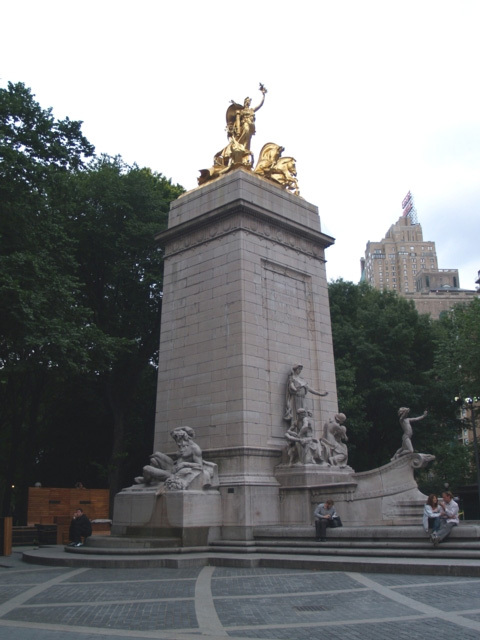 After his death a monument to the Maine was erected in New York City in Columbus Circle. AT THE TIME OF HER DESTRUCTION.